Faisal was the only son of Iraq's second king, Ghazi, and his wife Queen Aliya, second daughter of 'Ali bin Hussein, King of the Hijaz and Grand Sharif of Mecca. 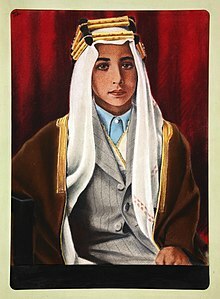 Faisal's father was killed in a mysterious car crash when he was three years old; his uncle 'Abd al-Ilah served as regent until Faisal came of age in 1953. King Faisal II was the model used by Belgian comic writer Hergé for his character Prince Abdullah of Khemed in The Adventures of Tintin. He suffered from asthma. Faisal's childhood coincided with the Second World War, in which the Hashemite Kingdom of Iraq was formally allied with the British Empire and the Allies. In April 1941, his uncle 'Abd al-Ilah was briefly deposed as Regent by a military coup d'état which aimed to align Iraq with the Axis powers. The 1941 coup in Iraq soon led to the Anglo-Iraqi War. German aid proved insufficient, and 'Abd al-Ilah was restored to power by a combined Allied force composed of the Jordanian Arab Legion, the Royal Air Force and other British units. Iraq resumed its British alliance, and at the end of the war joined the United Nations. During his early years, Faisal was tutored at the royal palace with several other Iraqi boys. During World War II, he lived for a time with his mother at Grove Lodge at Winkfield Row in Berkshire in England. As a teenager, Faisal attended Harrow School with his second cousin The Prince Hussein, later to become King Hussein of Jordan. The two boys were close friends, and reportedly planned early on to merge their two realms, to counter what they considered to be the threat of militant pan-Arab nationalism. In 1952, Faisal visited the United States, where he met President Harry Truman, Dean Acheson, the actor James Mason, and Jackie Robinson, among others. Hastening Faisal's demise was the decision taken by his regent (later confirmed by him) to allow the United Kingdom to retain a continued role in Iraqi affairs, through the Anglo-Iraqi Treaty of 1948, and later the Baghdad Pact, signed in 1955. Massive protests greeted news of each of these alliances, resulting in the deaths of hundreds of demonstrators and an increasing deterioration of loyalty to the Iraqi Crown. Prince Abdullah (holding hat) at Mount Vernon USA. He was the regent for his nephew Faisal during his infancy. They were both killed during the 1958 coup. Faisal attained his majority on 2 May 1953, commencing his active rule with little experience and during a changing Iraqi political and social climate exacerbated by the rapid development of pan-Arab nationalism. Faisal initially relied for political advice upon his uncle Prince 'Abd al-Ilah and General Nuri al-Sa'id, a veteran politician and nationalist who had already served several terms as Prime Minister. As oil revenues increased during the 1950s, the king and his advisers chose to invest their wealth in development projects, which some claimed increasingly alienated the rapidly growing middle class and the peasantry. The Iraqi Communist Party increased its influence. Though the regime seemed secure, intense dissatisfaction with Iraq's condition brewed just below the surface. An ever-widening gap between the wealth of the political elites, landowners and other supporters of the regime on the one hand, and the poverty of workers and peasants on the other, intensified opposition to Faisal's government. Since the upper classes controlled the parliament, reformists increasingly saw revolution as their sole hope for improvement. The Egyptian Revolution of 1952, led by Gamal Abdel Nasser, provided an impetus for a similar undertaking in Iraq. On 1 February 1958, neighbouring Syria joined with Nasser's Egypt to form the United Arab Republic. This prompted the Hashemite kingdoms of Iraq and Jordan to strengthen their ties by establishing a similar alliance. Two weeks later, on 14 February, this league formally became the Arab Federation of Iraq and Jordan. Faisal, as the senior member of the Hashemite family, became its head of state. Faisal (left) with his cousin King Hussein of Jordan. In February 1958, the two Hashemite Kingdoms formed the Arab Federation that lasted until Faisal was deposed in a bloody coup on 14 July 1958. Faisal's political situation deteriorated in 1956, with uprisings in the cities of Najaf and Hayy. Meanwhile, Israel's attack on Egypt, coordinated with Britain and France in response to Nasser's nationalisation of the Suez Canal, only exacerbated popular revulsion for the Baghdad Pact, and thus Faisal's regime. The opposition began to coordinate its activities; in February 1957, a "Front of National Union" was established, bringing together the National Democrats, Independents, Communists, and the Ba'ath Party. An identical process ensued within the Iraqi officer corps with the formation of a "Supreme Committee of Free Officers". Faisal's government endeavoured to preserve the military's loyalty through generous benefits, but this proved increasingly ineffective as more and more officers came to sympathise with the nascent anti-monarchist movement. In the summer of 1958, King Hussein of Jordan asked for Iraqi military assistance during the escalating Lebanon crisis. Units of the Royal Iraqi Army under the command of Colonel Abd al-Karim Qasim, en route to Jordan, chose to march on Baghdad instead, where they mounted a coup d'état on 14 July. During the 14 July Revolution, Faisal II ordered the Royal Guard to offer no resistance, and surrendered to the insurgents. Around 8 am, Captain Abdul Sattar Sabaa Al-Ibousi, leading the revolutionary assault group at the Rihab Palace, which was still the principal royal residence in central Baghdad, ordered the King, Crown Prince 'Abd al-Ilah, Crown Princess Hiyam ('Abd al-Ilah's wife), Princess Nafeesa ('Abd al-Ilah's mother), Princess Abadiya (Faisal's aunt) and several servants to gather in the palace courtyard (the young King having not yet moved into the newly completed Royal Palace). There they were told to turn toward the wall and were immediately machine-gunned by their captors. Faisal did not die during the initial fusillade and was transported to a hospital, but died en route. His body was publicly strung up from a lamppost. Many years later, when the Iraqi historian Safa Khulusi met Al-Ibousi, who was once one of Khulusi's students, and questioned him on his part in Faisal's death, the former student answered, "all I did was remember Palestine, and the trigger on the machine-gun just set itself off". Faisal II was the author of How to Defend Yourself (1951), an Arabic book on judo and self-defence. Admiral of the Fleet, Royal Iraqi Navy. Field Marshal, Royal Iraqi Army. Marshal of the Royal Iraqi Air Force. Air Vice-Marshal (honorary), Royal Air Force. Martyr Faisal II College (Kolleyet Al-Shahid Faisal Al-Thani) is a military school in Jordan that was named after him. Wikimedia Commons has media related to Feisal II of Iraq. 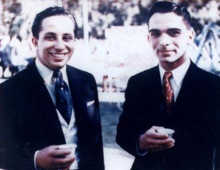 Sharif Ali bin al-Hussein – The cousin of Faisal II who currently lives in Iraq and has a political platform to establish a constitutional monarchy in Iraq. Nuri al-Said – The Prime Minister of the Hashemite Kingdom of Iraq who was also executed by supporters of Colonel Abdul Karim Qassim. ^ S9.com. Retrieved on 14 July 2008. ^ Eppel, Michael (1999). "The Fadhil Al-Jamali Government in Iraq, 1953-54". Journal of Contemporary History. 34 (3): 417–442. doi:10.1177/002200949903400306. JSTOR 261147. ^ Margaret MacMillan, "Iraq's twisted British roots". The Globe and Mail, January 23, 2003: A17. ^ Professor Safa Khulusi, Obituary, The Independent, 5 October 1995. ^ Royal Ark Retrieved 24 November 2017. "Young King". Time Magazine. 17 April 1939. Retrieved 24 November 2017. "Revolt in Baghdad". Time Magazine. 21 July 1958. Retrieved 24 November 2017. "In One Swift Hour". Time Magazine. 28 July 1958. Retrieved 24 November 2017. "Coins of Faisal II". Retrieved 24 November 2017. De Gaury, Gerald. 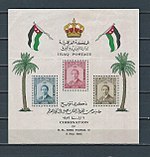 Three kings in Baghdad, 1921-1958 (Hutchinson, 1961).